Once known as apothecaries, the surgeons of the chaos legions were known in slang as Saw Bones for their frequence use of battlfield amputations. The warp is unforgiving and so few medics are called for in the chaos legions. The fallen are more often resurcted by their dark gods or converted to undying forms than saved by the Saw Bones aid. The Saw Bones narcathiums now rusty with disuse, caked in dried blood and injectors dripping with infectious venoms. Saw bones are equipped with a narcathium, a healing device, fitted to the arm of their armour, with which they can transfuse healing energies into their fellow renagades or stab and slash enemies. Saw Bones also carry a Chainsword to give them greater reach and Bolt Pistol with which to wear down foes. Keep close to other renegades, the Saw bones has a healing effect on near by allies. Stick near to high value chaos classes and use your primary heal to keep them alive. SawBones earn points for each time they heal a team mate, the more expensive the tema mate, the higher the reward. 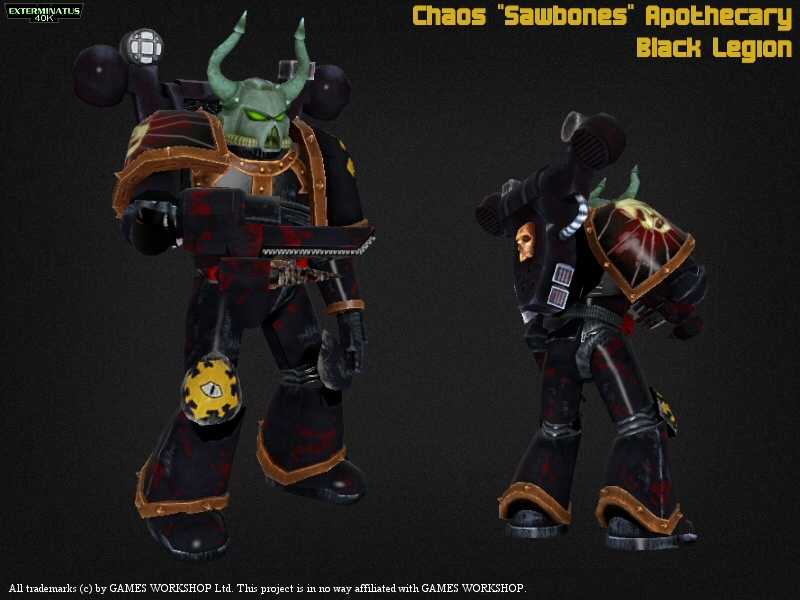 Apothicaries and healers rarely appear in Chaos codicies, but are essential for balancing EX, so the SawBones class was invented to fill the role of chaos medic.